When somebody drops into a store, it’s easy to find a salesman who will answer any question about products. Online stores don’t have such an option but they have special pages which do the salesmans’ job. These pages are called FAQ (Frequently Asked Questions) pages. As an FAQ page includes content, it can improve SEO. It also allows for adding metadata which helps maximize the chances of reaching the top ten. An FAQ page improves credibility via question response rates. People who visit it often are frustrated because of service issues, so an FAQ page is a chance to bring back some of that loyalty..
An FAQ page allows you to reach those customers who feel ashamed to call customer support as well as those who buy at times that are outside the normal operating hours of phone support time. There is a simple trick which will help you to define what questions should be on an FAQ page. Ask sales or customer support workers to give you the list of questions they frequently receive from customers and analyze the list and write comprehensive, honest answers. Once you create an FAQ page, you’ll need to keep the data up to date. While developing business, new questions will appear and answers will expand and change over time. This also means that in some cases, old responses will become obsolete. Don’t forget to remove the old ones and replace it with the latest ones. In this article, we’re going to review some inspiring examples of FAQ pages. We’ll also mention a few extensions that can be used to create an FAQ page on your store. Myfelt sells rugs, that’s why its clients are interested in such questions as what fabric are the rugs made of, where are they manufactured, how to pay, how to return and how to clean already bought ones. It seems like a bunch of simple questions which will overwhelm the page but Myfelt’s team found another solution. They divided all content into five parts: Products and Manufacturing, Orders and Payment, Delivery and Returns, Cleaning and Care, and Contact. This made the FAQ page clear and easy to navigate. When a user opens the tab they can easily find the section needed and it saves time for the business and for the consumer. Myfelt put clickable buttons with names of the parts above the list. When you select an item, you are automatically brought to the correct section. Answers initially are closed, but clicking on “+” signs in the right side of every question opens a field with the text you need. This solution avoids publishing too much unnecessary information on your page. Venroy sells clothes, and its users want to know how to find out what their size is, how to access their account if they’ve forgotten the password, and when to expect a new arrival. Venroy made a beautiful minimalistic FAQ page. They created two blocks users can choose between, and added little arrows by clicking on which drop-down lists of questions appear. If you have a lot of stuff sold on your online store, you may not be able to do the same. This approach fits sites with a small number of questions that may arise. For instance, Venroy displays only 7 answers on its FAQ page. Rebecca Minkoff’s online store sells womens clothes and accessories. Their most popular questions concern delivery options, exchange policy, and what to do if you get a damaged item. 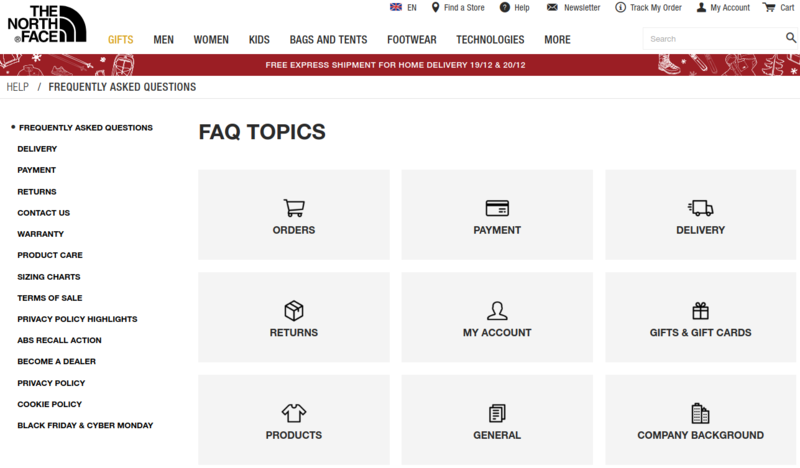 You probably noticed the text Rebecca Minkoff’s put on the top of the FAQ page. They suggest visitors read existing answers and in case they don’t find an appropriate one, they have an option to call or send an email. This helps set the tone with users once they visit the page. Remember, those who go to the FAQ page have questions or issues with your service so it’s a nice way to show a customer that you care about them and that you keep your word. Rebecca Minkoff also split their questions into five groups but placed them on the left side of the page. If you click on the name of a group, you will be transferred automatically to where you need to be. We also mentioned this when talking about Myfelt’s online store but Rebecca Minkoff took it a step further. They made buttons which can return you to the top of the page. It’s a very useful feature which is implemented in a small number of online stores. But, since it improves user experience, we are sure this feature is worth adding to every e-commerce site. The North Face is an American brand specializing in clothing and equipment for outdoor enthusiasts and athletes. The company is huge. Since they manufacture a wide range of products they get a lot of questions about clothing, returns, and account management. In order to make the FAQ page clear and accessible the North Face divided all questions into topics and visualised them with a grid menu. Pictures appeal to people because we perceive visual information faster than text. So, if you can replace words with an illustration, do it, but don’t forget about the webpage performance. In this case, clicking on an icon opens a new webpage where questions and answers are listed. It’s not convenient because, in this case, a user has to wait until a new page is loaded. If they have an unstable or weak connection they may get bored because of the delay and leave a website. Moreover, companies driving for maximum profits tend to make a user experience easier and faster these days. So, even a little user-friendly FAQ page can give a big advantage over poorly designed pages of your competitors. When a user arrives at a certain topic and wants to move to another one, they shouldn’t need to return to the previous page to do so. This setup allows them find it in the list on the left. There are plenty of Magento FAQ extensions on the internet and you can choose the one which provides the most appropriate features for your business. If you already have an idea of how your FAQ page has to look and there isn’t an extension which perfectly matches your needs, you can ask programmers to develop it manually. This approach means high reliability, opportunity to implement almost any function, and all opportunities to stand out. Disadvantages of such developing are that it takes a comparatively long time, and it costs more than simply installing a ready-made extension. In fairness, it must be said that even if an extension doesn’t include a feature you need it can be modified so as to add that capability. Such work will be faster and cheaper. Today we suggest you to consider two FAQ extensions for Magento we’ve used in our projects. We chose them to illustrate differences and to give you a general idea of a wide range of extensions available on the internet. If these suggestions don’t fit your business, don’t hesitate to contact us. Our designers will create a custom design for your Magento 2 FAQ page within a reasonable deadline. This extension is packed with the most necessary features you need to run a Magento FAQ page on your store. It displays all the questions and answers on a single page so that visitors don’t have to wait for page reloading. The extension suggests an accordion design with “expand” buttons beside every question. We have already considered such designs in this article. 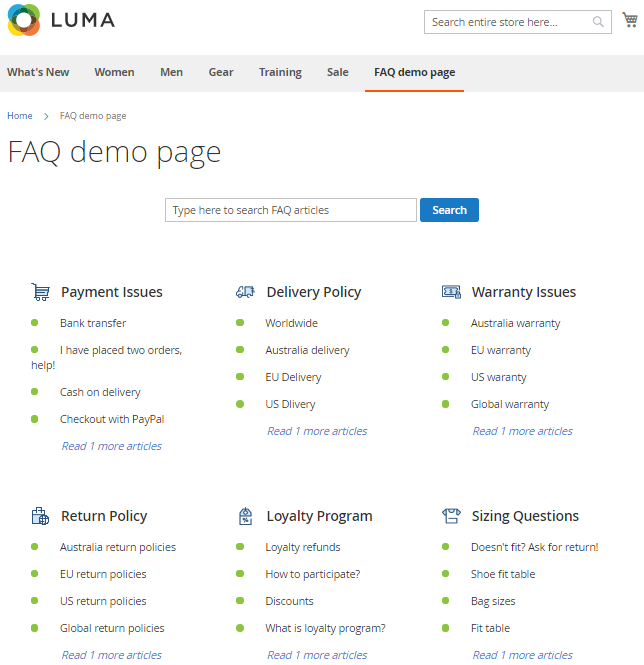 Check out how it looks on default Magento 2 theme Luma. As you can see, the extension allows creating groups, sorting questions by groups, adding icons, etc. When you click on the button of a group, the page scrolls down to the relevant part. Also, the module enables you to use images, widgets, and static blocks as answers. For example, if somebody complains they couldn’t find rainbow trousers on a store, you can just add a block with their preview into an answer field. 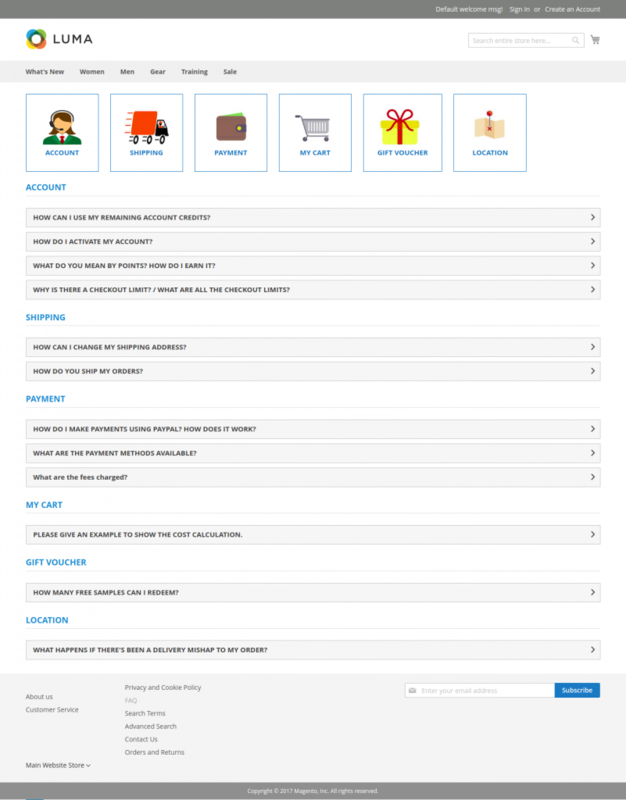 This simple extension is free and can be downloaded from Magento marketplace. AheadWorks has developed an extension which includes a lot of advanced features. This presents the data in column format with names of categories. Also, this provides the ability to define how many questions will be shown on the FAQ page and how many of them will be hidden behind the “view all” button. Clicking on “view all” opens a new page with a list of all category questions. When a user chooses one of them a new page appears again, but this time it contains an answer. Such implementation allows writing a long-form piece in order to respond to a question. Additionally, this FAQ module for Magento has a voting option. Customers can thumb up or down an article if they think it was helpful to them and vice versa. If they click thumbs-down they get a message suggesting further assistance. The extension gathers statistics and shows the article ratings to the admin. The extension allows uploading a custom icon for each topic. Using the extension you can also restrict viewing particular questions or categories for some groups of customers. It might be helpful if you have VIP type clients which have their own requirements. As you see on the screenshot, there is the search field above the list. It can be disabled if you decide it’s not necessary. To be honest, such option is kind of the fifth wheel for stores with a small number of questions on the FAQ page. A very useful feature is that the extension allows placing a special form on articles page where people can submit their questions. So, if users have read your article and they still have questions they can ask you. You will receive their queries and decide whether to edit the article. Also, this way presents you with the opportunity to respond to your customer in person which will definitely warm them up to your brand by showing how much you care and are willing to help them. And the icing on the cake of the extension is its SEO-friendliness. Your answers serve as created content, and since they’re located on different pages and segments of the website/store you can tune up URLs, metadata, sitemap.xml, etc to work in your favor. It will bring you new prospects from Google and help with your SEO ranking..
As you perhaps guessed it, this extension isn’t free and its cost is $249. You can download it from the AheadWorks website. So, FAQ Magento pages are frequently underestimated in importance but they can bring you generous benefits such as new customers due to simplified access to information and UI’s and helping turn around the opinions of frustrated existing customers. Although extensions are the fastest and most efficient option for implementing an FAQ page on an online store, we recommend developing the page based on your target audience’s needs and requirements. The custom design stands out and perfectly attracts the target audience while extensions make FAQ pages casual, informal, and relatable. If you look for professional developers who can create a Magento FAQ page, be sure to contact us.